The sequel to the international bestselling novel The Art of Hearing Heartbeats. Almost ten years have passed since Julia Win came back from Burma, her father's native country. Though she is a successful Manhattan lawyer, her private life is at a crossroads; her boyfriend recently left her, she has suffered a miscarriage, and she is, despite her wealth, unhappy with her professional life. Julia is lost and exhausted. 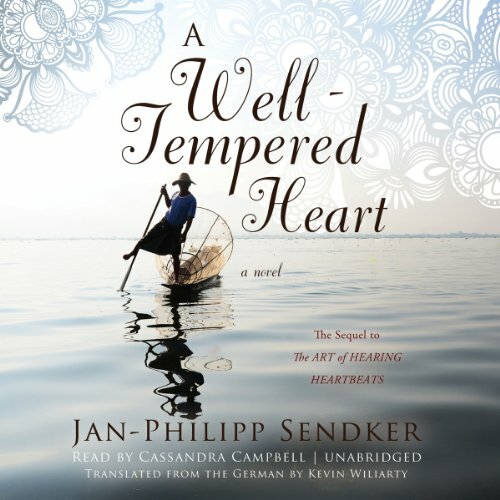 ©2014 Jan-Philipp Sendker (P)2014 Blackstone Audio, Inc.
What did you love best about A Well-Tempered Heart? I read his first book - "The art of hearing heart beat" which is pretty much a must to start with before reading this one. They are both written like a poem , like a melody of one's spirit. The book left me thinking and wondering about one's choices in life and the always existing opportunity to forgive and move on. Listening to one's Intuition is the key element which spoke to me. What other book might you compare A Well-Tempered Heart to and why? the first book -" The art of hearing heartbeat" and "on thousand white woman" by Jim Fergus. We all go through life on particular paths, some of which don't fit as we travel them. This book explores what happens when Julia jumps off, or maybe is pushed off, her regular life. Beautifully written and faithfully translated, the story captures you immediately and subtilely transforms you. If you don't want to change then don't engage with this book. You may find yourself quietly watching both nature and those around you with new interest. I couldn’t wait for this book to be over. Soapy premise and poor explanations of events. Having loaded a few dozen books on my iPod nano, I scrolled through and chose this book at random, forgetting even why I purchased it in the first place. I had forgotten it was a sequel until I finished the book and was preparing a review. So well written, I did not feel lost or confused or even suspected there was another book with more background information. I was captured within minutes of the beginning of the book. The story starts as Julia, a successful manhattan attorney is standing to give an important presentation when she clearly hears a woman's voice in her head warning her of danger. It throws her off base enough that she panics and leaves without explanations. The journey she takes to discover why she is hearing this voice and what it could mean to her requires delving into her past life; her "unfinished business" or unresolved issues in her personal life. Stateside doctors prescribe anti-psychotic medications but instead, Julia feels drawn to connect with her Burmese half brother who she has not seen in years. Her journey takes her to Burma where she shares her problem with her brother. As she and her brother travel to speak with people her brother feels may be able to help her, Julia is Burma told the voice she hears is a woman who died, and is reincarnated within Julia's body. The woman died with unresolved issues and whose spirit is now residing inside Julia's body as well. There is no way to rid herself of these voices, unless perhaps she can discover the reason the woman is troubled. Doubtful of the truth of this, Julia allows her brother to take her on a journey following clues to learn more about the Burmese woman and her troubled life. The author brilliantly weaves within our heroine's story the story of the deceased Burmese woman and her incredible story. As the Burmese culture and belief system is woven within the story, the plausibility of this woman being the voice in her head become totally believable and this story becomes real, no longer fiction, and a testament of one person's journey through unspeakable suffering and the strength of the human spirit. It always amazes me how a book's enjoyment and meaning can be so different for each person. This book was beautifully written as was the first one! The prose was so special. Cassandra Campbell was a perfect narrator once again. I totally enjoyed the entire production. 5 stars on everything!!! What was one of the most memorable moments of A Well-Tempered Heart? In this emotionally driven and passionate sequel to "The Art of Hearing Heartbeats," Julia returns to Burma to find her brother and answers to her own heartbeats. Yes.. a touching love story. Listened some time ago..don't remember the sister/brother name but it was a good book. Precise, clear reader. Took her time to tell the story well. Touching at some points, also made me laugh too. The story did not grip me as did the prequel. Some characters were poorly developed and significant plot lines left open. Would you try another book written by Jan-Philipp Sendker or narrated by Cassandra Campbell? I loved the prequel to this story and read it in the traditional way (ie hard copy book). The story was beautifully written, endearing and a lovely change to the hustle and bustle of every day life. I lost myself in the story and felt very peaceful every time I read it. As I'm a commuter, I thought I'd try the next book via audiobook but try as I might, I just couldn't get past the narrator's irritating and ingratiating voice. I can only assume that as the book is such a lovely but somewhat calmly written story, the narrator decided to read it in a kind of breathy, whimsical way which only served to annoy me. There were long breaks in the narrative which were wholly unnecessary and I guess were only used to set the 'mood' but the only mood it generated was a bad one! I tried to get past this by perseverance but despite going for over two hours, I just found the only thing the irksome voice was doing was ruining the story for me. The voice just didn't sit with the characters and made them all sound just that little bit pathetic rather than the strong, independent person that the lead character was, albeit someone who is feeling a little lost along the way. I've started reading the book and it's alot better. I actually really hate writing bad reviews as I feel it is unfair and can be taken personally which isn't my intention. I would be happy to try another book that the narrator has read but this time, it just didn't work and it didn't work badly.